"This recipe won first place in a contest in Canada. Wonderful dessert muffin!" Place raisins, sugar, butter, eggs, milk, and vanilla in a large heavy-bottomed saucepan. Cook over medium heat, stirring frequently until mixture is hot, slightly thickened, and just beginning to bubble, about 4 to 5 minutes. Cool slightly, uncovered, in the refrigerator, while continuing with recipe. Preheat oven to 375 degrees F (190 degrees C). Grease 12 muffin cups or coat with cooking spray. Stir flour with baking powder, soda, and salt in a large mixing bowl. Make a well in center and pour in warm raisin mixture, stirring just until combined. Stir in nuts until evenly mixed. Spoon batter into muffin cups. Bake at 375 degrees F (190 degrees C) in center of oven until golden and a cake tester inserted into center of a muffin comes out clean, about 15 to 17 minutes. Remove from oven and immediately pour about 1 teaspoon syrup over each muffin. Cool muffins in cups for 10 minutes, then remove to a rack. Serve warm. This is the next best thing to butter tarts! They are moist and yummy and easy to make! They were a huge hit at home and work! These were really yummy, easy to make, and held their moisture the next day. I would make them again. Very easy and quick to make. Delicious!! 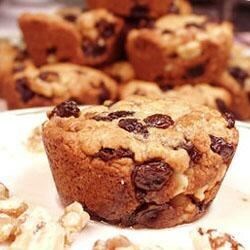 These muffins were wonderful for breakfast and were a nice change from blueberry.